Christmas! This morning on our way to school there was so much rain, thunder and lightning that it definitely felt like at least October, so making the block of Dec 21th - shortest day of the year - was quite appropriate. It was not a big block, a little sheep, but with this one the whole left section is finished! 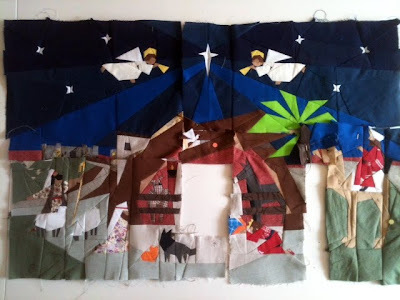 It's Sunday-evening and after a busy but nice weekend I'm glad to show you a picture of the Nativityquilt so far. Yes, the camel is finished! The left side with the shepherd and sheep looks a bit messy, but that's because I used a few pins, the parts are not sewed together yet. 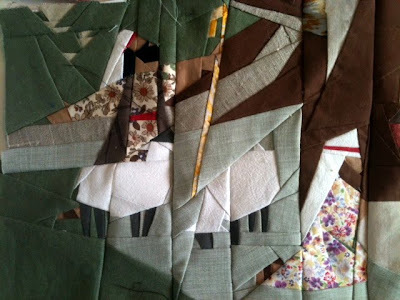 Next step is the missing sheep, so I can finish the whole left part. It's still a quite exciting project, I'm looking forward to make that sheep! And since it's fridaynight right now, I'm sure there will be some sewingtime in the next few days. Everything is ready (even the camel without legs)! So I wonder: has anyone of you some nice pics of quilts and other sewing projects on Pinterest? En zijn er ook al nederlandse quiltfoto's te bewonderen? So the camel is growing, and I left every piece of fabric at my desk so I can start as soon as I find som time to give this animal a pair of legs! As you can see, my china cabinet is still there, waiting for a finishing touch. It's been a while ago, but we've been caravanning in France, from the westcoast - Juno beach - to the Mediterrannée. We had a great time together, enjoying the land, the food, the sunshine, the landscape, and sometimes even a little patching! I made 6 big blue stars by hand, nice job to do, in the morning when the kids were still asleep.